My life as an artist began shortly after I was able to control a pencil, creating drawings inspired by nature: mostly of landscapes, trees and horses. In my adolescence I discovered pen & ink and began refining my work with the detail I have become known for. Initially trees were my preferred subject matter, inspired by dormant deciduous trees and enticed by the intricacies of spider-webbed branches framed against the sky; pen & ink as my primary medium. While I was an art student at New York University (graduating in 1968), I was introduced to Abstract Expressionism, a school of art I began exploring in the mid to late 1970s. A wonderful learning experience in oils, I came to understand that creating art was about problem solving – defining compositions that were both asymmetrical and balanced. In the late 1980s I became mesmerized with Chinese Brush painting when I was introduced the the works of Chinese artist Charles Chu. I spent the next twenty-four years mastering the art after taking some courses with Chinese artists, continuing with landscapes, animals and birds. Though I continued Chinese Brush work, I was beginning to feel less enamored with it. It was around this time that I began exploring abstract pastel on lightly textured papers that I titled my Feminine Mystique series (2004-2008). I began the Birch Series in 2008 when I felt a need to change my focus, Chinese Brush Painting no loner made my heart sing and the Feminine Mystique series felt complete. Since April 2014 I have been totally focused on pyrography. I love the challenge of creating creatures of fur, feathers, or fins, exploring ways to bring life to each through the art of pyrography. I always begin with the eyes to capture the essence/soul of the animal – an approach that comes from my Chinese brush training. Once I am satisfied with the eyes, I work on the rest of the piece, burning lightly, and then reworking with appropriate pens until I am satisfied. My process involves the ‘magic’ of lines which, for me, define shapes and details that construct the three-dimensionality that is a defining characteristic of my artistry. I begin with an idea, sometimes inspired by the wood itself. I generally do not pre-sketch on the wood – preferring to begin each piece with pyrographic pens, though I do create a basic plan when I am cutting shapes with my scroll-saw. 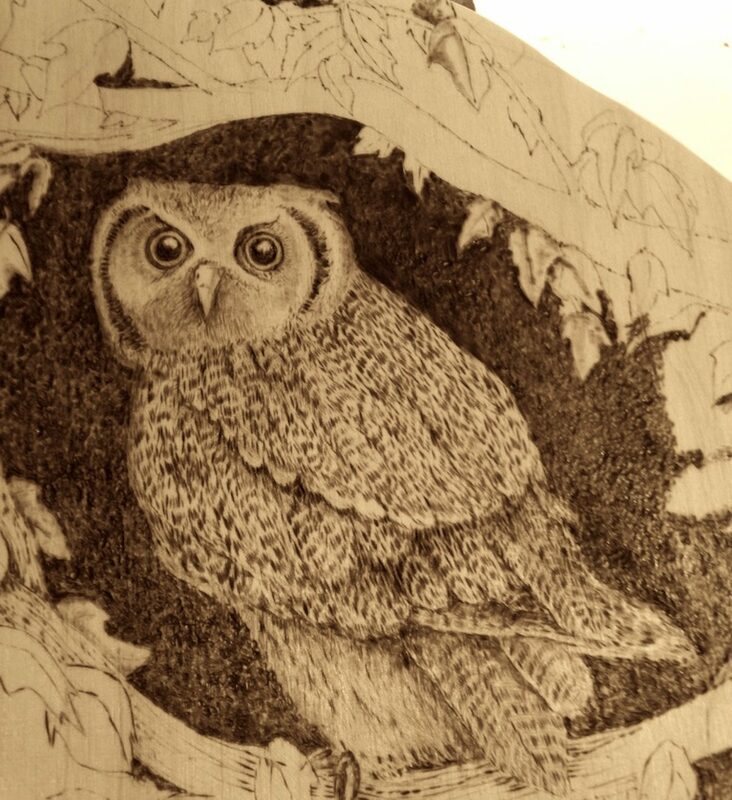 From pen & ink to pyrography with a variety of media in between; a natural leap. Pyrography is a visceral experience: I love the natural colors of burned wood, feeling no need to add color.